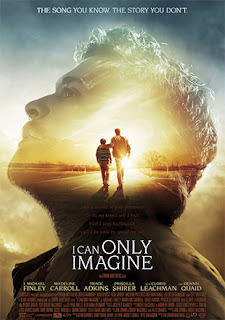 If MercyMe’s “I Can Only Imagine” song was the breakout hit to show that Christian music could be profoundly moving, then the movie of the same name has a real chance to achieve this very same thing for the Christian film genre. To all the Christian artists making religious “movies” out there, I want you to take a day off from what you are doing, buy a ticket to “I Can Only Imagine,” and pay attention: This is how you make a real film. Unlike other films of this type that are released every year, this is, first and foremost, a movie with a story and characters. It has conflict and many moments of humans behaving badly. God is a divine force that changes the hearts of cruel men, but he is not a genie to be rubbed to take all problems away. We are still dealing with human beings, which is something other Christian movies seem shockingly oblivious to. Now, granted, it helps that this is based on the true story of Bart Millard (J. Michael Finley), the lead singer of MercyMe. This isn’t an original screenplay where the producers set out to preach a sermon and write an insulting story around the message; this is a story of someone who lived through real hurt, abuse, and had serious doubts about where his life was going. That he is a man of faith is there, but he does not get a free pass in life just because he believes in a higher power. In fact, for a guy who would eventually pen one of Christian music’s most popular songs, he manages to hurt several people who are close to him while only thinking of himself for a good portion of the film. It’s almost as if Bart was *GASP* a HUMAN! You know, I’ve seen so many Christian movies where the humans occupying the film are just robots discussing the virtue of pray and forgiveness, that it’s sort of a surprise to see someone in one of these films actually struggle with those concepts. What’s more, the human struggle presented in the movie isn’t really about the success of the band (though there is a moment or two dedicated that to that as well), but between Bart and his father (Dennis Quaid), a man who is verbally and physically abusive. This is where “I Can Only Imagine” is at its strongest, as it is the most relatable aspect of the movie. Many have had bad relationships with a parent. Many have had fathers who beat them for no reason and told them they were not worth a dime. Bart’s dad is not a good man and his reasons for being bad are not justified. He is simply bitter and resentful at how life has turned out for him. He does go through that spiritual change that must happen in a movie like this. However, it is a subtle change, and comes in a way that can only be described as God changing his heart. And here is where “I Can Only Imagine” is different from other Christian movies: The change happens because God touches people, not because a case for God was argued on. If the idea behind God is that He is a spiritual Father who touches lives, why do so many Christian movies come out with guns firing and fists swinging? Why must a court case be made for God not being dead? Isn’t it much more effective for Bart to see a genuine change in his father, have a new relationship with him, and then turn to the sky to realize that someone much bigger than him was out there watching out for him? This is first and foremost a movie about people. It has characters we like. It is also about God, yes, but it is about a God who works through people, music, and relationships, and doesn’t take personal offense when someone doesn’t believe in Him. It is also, I must admit, directed and acted with more polish than I usually see in a movie from this genre. When the moment comes for the inspirational title song to be sung, it is built up in a way where the meaning behind it is fully understood, and therefor more impactful. Is it a movie non-Christians can enjoy? Well…I can’t really answer that for you. I think it has a better chance than most because of the focus on the father and son relationship, but it is still mainly targeted to people of faith and will resonate with them more. But considering all the bad movies that Christians watch because they are so desperate for something meaningful and wholesome, it is a relief to see “I Can Only Imagine” excel in all the areas the others have failed. I believe this is the movie the Christian genre desperately needed, and it was long overdue. Parents, there is some mild violence involving abuse, but no language or sexual content. Recommended for ages 7 and up.